Diva Dhar is Associate Director of Capacity Building for CLEAR/J-PAL South Asia at IFMR. Diva works on strengthening monitoring and evaluation capacity in the region and promoting evidence based policy and decision-making. 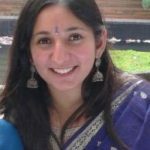 She has previously worked as a Research Manager for J-PAL South Asia and as a Project Associate for J-PAL/IPA in Morocco. She has overseen several randomized evaluations dealing with education, gender, urban services, governance and microcredit in India, Morocco and Bangladesh. She has also worked as a consultant for the Planning Commission and with the UN and other NGOs in India. Her research interests include gender and education. Diva has a Masters in International and Development Economics from Yale University and a B.A. in Economics and International Relations from Mount Holyoke College.